Santa Clara, CA – OnChip added a wide range of devices to its capacitor product-line. Additions include axial, radial, surface mount, and V-chip film capacitors. These new devices expand OnChip’s previous line of capacitors by offering solutions for PCB designers who do not use wire bondable die in their circuits. These parts are moisture resistant and rated for DC circuits anywhere from 4V up to 2000V. All of OnChip’s capacitors are Pb-free and comply to the RoHS directive. OnChip’s new capacitors are available with a variety of dielectric materials. The CA series is a tantalum bead capacitor available in radial thru-hole or surface-mount packages. Tantalum capacitors are ideal for applications that require high capacitance but have limited board space. The CBB series features a polypropylene dielectric that provides a dissipation factor of <0.002, as well as providing consistent capacitance values for applications with fluctuating frequencies. The CL series is built with polyester and is incredibly stable for long-term usage. 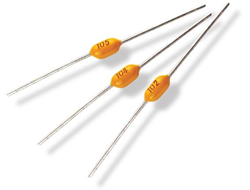 CL capacitors feature a precise tolerance as tight as 1%. The CT series is a ceramic capacitor with options for different dielectrics such as NPO, X7R, Z5U, and Y5V. NPO is recommended in applications where capacitance value needs to be stable in varying temperature, frequency, and voltage. X7R, Z5U, and Y5V have predictable properties that can be used to manipulate the capacitor’s capabilities when subjected to these same variations. The TC series of V-Chip Capacitors provide a surface mount option that is good for ripple currents and switching power supplies. They are built to withstand high voltages and protect sensitive parts on the PCB in the event of a short circuit. All capacitors have a rated load life determined by the hours that they can function at maximum operating temperature, while maintaining their electrical characteristics. These new capacitors are in stock and available for immediate delivery. High volume demands can be shipped within a few weeks. The products offer very competitive pricing. Please contact factory for additional details.